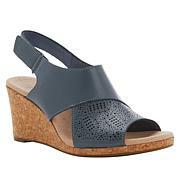 Pop the cork on your warm-weather looks with a shoe that's as comfortable as it is chic. 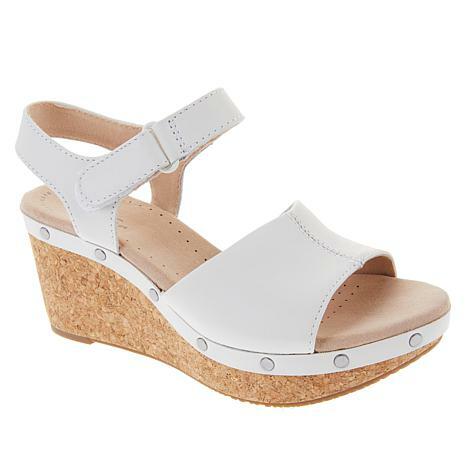 This full-grain leather wedge sandal features Clarks' signature Ortholite footbed and full-length cushioning, plus its metal stud trim adds a stylish edge. The shoemakers at Clarks know what it takes to keep feet healthy and happy. What began with a sheepskin slipper nearly 200 years ago has evolved into a versatile, modern assortment of footwear incorporating advanced construction techniques, technologies and materials that go into each pair of tailor-made shoes. No matter what your style, no matter what the season, there’s a comfortable Clarks shoe to suit your tastes and your lifestyle. 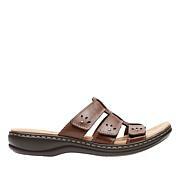 Slip into summer style with these leather and stretch fabric sandals. A soft, square toe and chunky leather heel add a retro vibe that's totally on trend.